I should have been a philoligist, like Nietzsche. I always want to know the etymology of words thinking it will clear everything up, but it never really does. I recently read Why I Rarely Say Namaste. Yoga seems to approximately mean “uniting” or “concentration.” I’ve practiced yoga on and off for 15 years. 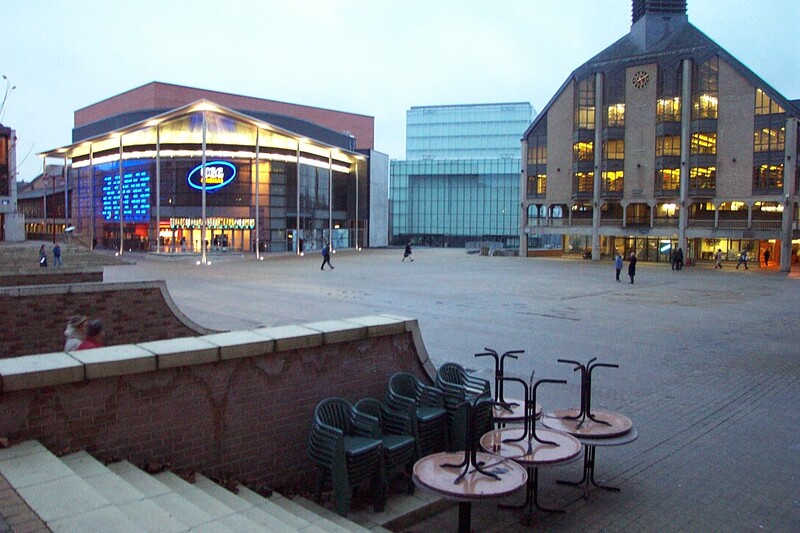 When I first practiced yoga, I was living in a planned New Pedestrianism city in Belgium. It was bizarre. I arrived two weeks too early for the Fall semester and the town, which then revolved mostly around the University, was pretty much deserted. I sat alone in the square and felt absurd. As in, Absurd. The University had aerobics classes which were also absurd, with a small “a.” In one corner of an enormous indoor athletic complex, students would arrive in pajamas and no one lined up correctly, a mess of people too close to each other or too far away. It offended me completely. 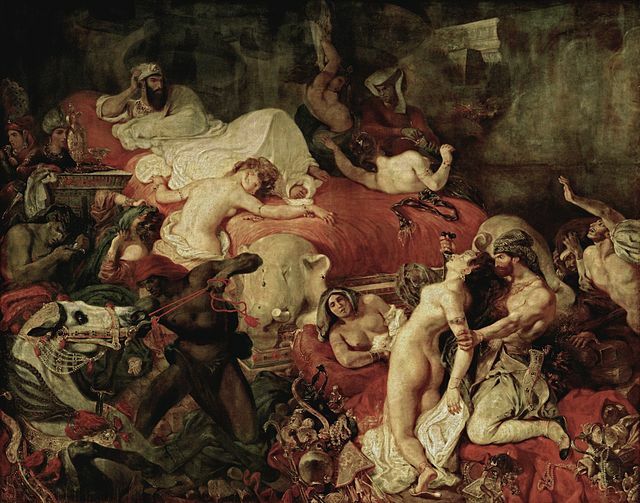 Eugene Delacroix “Death of Sardanapale” (1827). So, I tried yoga; it was in a dance studio with wooden floors, mirrors and barres against the wall. I approved. I didn’t understand most of what the instructor was saying. He was a tiny blonde man and he smiled at me in a kindly way. People lined up correctly, because he made them with a light sparkly touch. I didn’t know what I was doing, which I would have normally shied away from. For the first time, I didn’t care if I was good or not; there was something else pulling me back week after week. Visually it was as though I was being beckoned out of that planned city, over its parking garage foundations, across the green land that surrounded it, into an ancient forest. I was no rogue, though, there was a neat path laid right in front of me. I did hesitate before entering the forest, but its magic and my curiosity pulled me in. 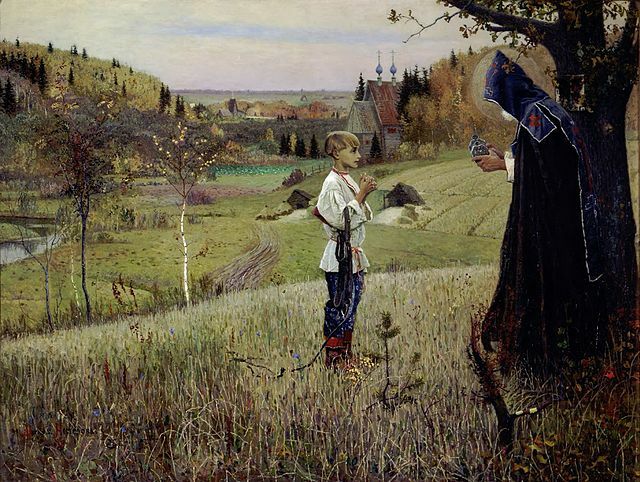 Mikahil Nesterov’s “Vision of the Youth Bartholemew” (1889-1890). 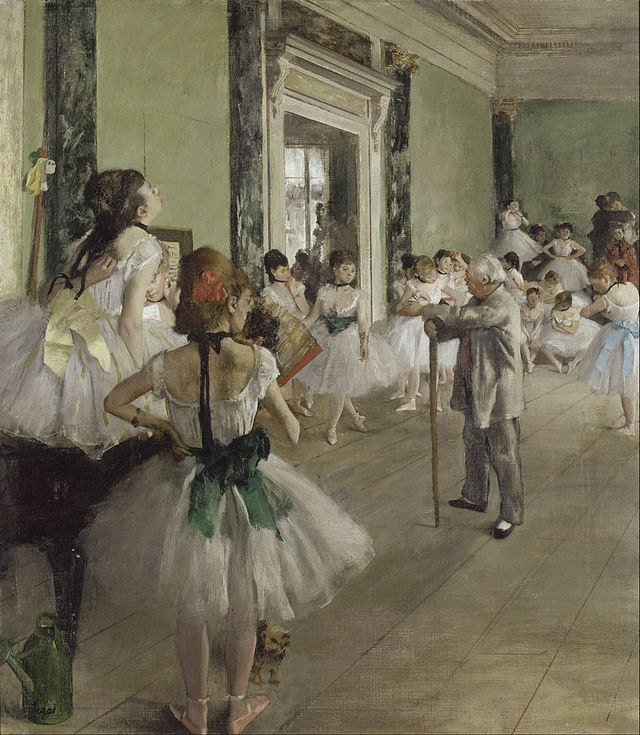 All works by Nesterov (1862-1943), Delacroix (1798-1863) and Degas (1834-1917) are in the public domain. Beautifully composed, your vivid descriptions pull in the reader. I am looking forward to finding out what lies deep in the forest. I must say I have had a similar experience with doing Yoga, the surroundings are so important to practicing Yoga.